Wednesday 04. April 2018 - SAi is showcasing the digital future of corrugated manufacturing at the iCorrugated Asia Expo, March 21-23 in Shanghai. An exhibit of corrugated packaging and display work highlights the outstanding print quality of the ultra-high-speed EFITM Nozomi C18000 single-pass, direct-to-corrugated LED inkjet corrugated packaging press, along with a virtual reality (VR) demonstration of the press offering visitors a unique way to experience this breakthrough solution. EFI’s exhibit also features the company’s industry-leading corrugator control and closed-loop process control technologies, EFI Escada software. EFI supplies management systems to packaging converters throughout the Asia Pacific region. The company is committed to bringing the latest, world-class digital printing and production workflow management to China, and will be discussing new opportunities for packaging professionals both at iCorrugated in March and in next month’s SinoCorrugated South tradeshow in Guangdong. In a highly competitive marketplace, not only do manufacturers need to focus on improved efficiency in their corrugated operation, they also need to be able to offer new solutions that meet demands for high-quality, fast-turn, full-colour printing direct to corrugated. Increasingly, brands and retailers want to produce full-colour secondary packaging and corrugated displays that send a strong brand message while also offering an innovative marketing platform. The Nozomi C18000 is the ideal solution to meet this challenge. 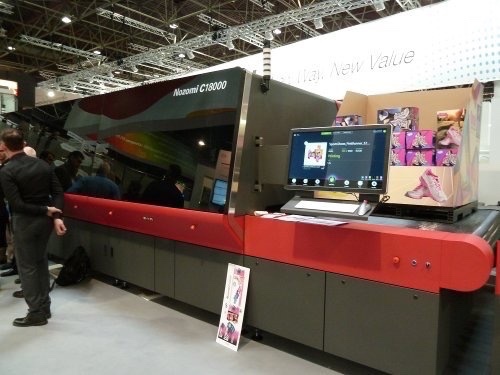 This single-pass digital LED printing system is available in configurations that include up to six colours (CMYK, orange and violet) plus white, with printing speeds of up to 75 linear metres per minute on a maximum sheet size of 1.8 x 3 metres. It is the ideal addition to corrugated operations seeking to differentiate themselves and generate new revenue streams while adding significant value for customers. EFI’s complete, integrated workflow for corrugated production and process control includes the market-proven, efficient EFI Escada software – a complete, modular system that drives automation and helps converters ensure consistent board quality across multiple shifts. When fully implemented, users report an average 6% increase in production, which can translate to 6.7 million additional square metres of production per year based on a three-shift operation averaging 150,000 square metres per shift. Optima: An integrated rollstock system that supports both barcodes and RFID roll tracking. Optima keeps accurate, real-time track of paper stock, helping to reduce stock levels. Syncro 7: A control system that automates corrugators from the wet end to the dry end, increasing productivity while reducing waste. It includes roll stand monitoring, roll stock interfaces, wrap arm position monitoring, paper break detection and waste tracking. Profile: A closed-loop process control system that, from a single point, manages all of the processes for improved quality, repeatability of product, reduced waste and increased customer satisfaction. Vision: A bespoke, pre- and post-corrugator application that can include such capabilities as sales order entry and management, order and pallet tracking, and sheet counting. Clarity: A powerful analysis and reporting tool with a flexible, user-friendly interface that brings together all of the data collected from each individual Escada module, providing critical information for making real-time, fact-based business decisions.